Abby - The book was great. I followed along the blog while you were at sea, but it was really great to have the background that you gave in the book and some of the real emotions you were feeling. You should be proud of yourself. I'm proud of you. wow. your achievements and experiences are awesome for someone young like u. congrats. Excellent Abby. Best of luck to you. glad you're having great time abby, go ahead!! Have a good Abby The MacKlem's SD. Ca. I think the better questions from the kids are because they are still emotionally honest and haven't got a network's agenda behind every inquiry, hahahah! I hope you get a chance see "Soul Surfer". It was such a great movie and I think you would enjoy seeing someone else who has made the most of what God has given them just as you have. Keep encouraging those that God puts in your path to make the most of what they are given. If you hate public speaking, perhaps there is an Aaron around. You should be so proud of yourself. 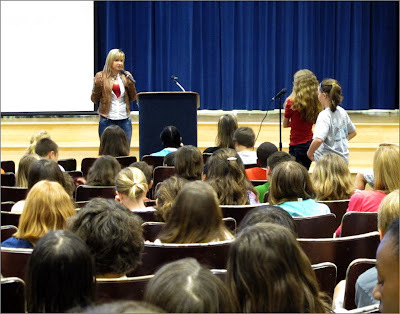 The thought of public speaking terrifies me, even if it was in front of children. Their questions are more interesting that adults because of their innocence. Glad you are having such a great time. Are you coming to New Jersey? Abby~ I am asking for your book for my birthday! Just saw the movie "White squall;" (I know, its sad) ...one of my favorites! The song by Sting (Valparaiso) with the following lyrics is now stuck in my head! Have you ever been there? Abby, Your book was wonderful and I was sorry to see it end. And it is a testament to your fine upbringing. I'm sure your parents are proud of you. So, now you need to get another boat and sail around the world. Why not team up with Zak for a long voyage. That would be an excellent book also. Congratulations on your fine achievements. Nancy M.
You look and sound great Abby! And I know what you mean about the kids. They have such an unclouded and unpretentious view of things, and excitement to spare! I just watched your documentary "Wild Eyes" (it arrived today). It was excellent! I really enjoyed it Abby! It brought me right back to your adventure and the inspiration it gave me! Thank you! You are a remarkable young woman! Kids are smart. :) And you are a wonderful inspiration to them. I just finished reading your book and want to say that you are a truly incredible young woman. Thanks so much for sharing your story.